I’m very excited to begin my residency at the Beaverbrook Art Gallery today. I’ll be presenting RITES, a series of improvised performances and interventions that will explore the Gallery’s permanent collection and especially its physical space — how visitors inhabit it and how we relate to art with our bodies. 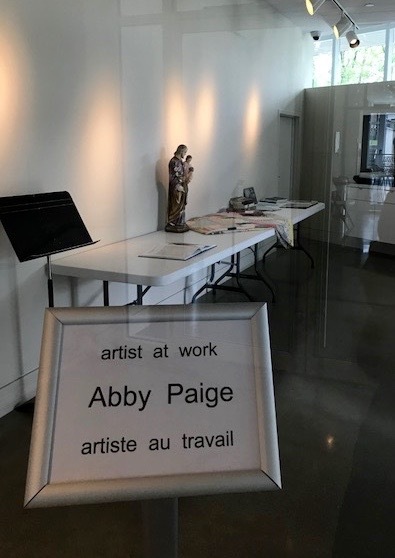 I will be present in the Gallery and the Bruno Bobak Artist Residency Studio every day this week, creating work, leading workshops, and sharing with visitors. Please stop by if you’re in Fredericton! in the labor of my hands. This is how my show, Piecework: When We Were French, begins: the old woman who cleans the sanctuary of St. Joseph’s Cathedral in Burlington, Vermont, sets down her bucket and rags and prays before a statue of the church’s patron saint before she begins her work. In this moment on stage I, the actor, kneel before a statue of St. Joseph and speak this prayer (written by me) in my character’s voice, which is also my own voice. I am also about to begin my work. I chose to open the show this way so that in this moment, my character and I would collapse into each other. We both ask that our work be meaningful and useful. Joseph is the least exalted member of the holy family, and where he is exalted, it is mostly for the grace and steadfastness with which he accepts his subordinate position. Here, he is praised for his silence, humility, and honesty, which are tied to his vocation as a father and his trade a carpenter, which he passed on to his son. His ability to find joy in his work, to bear his poverty with dignity, to serve his family, to endure difficulty without complaint makes him an admirable patron. 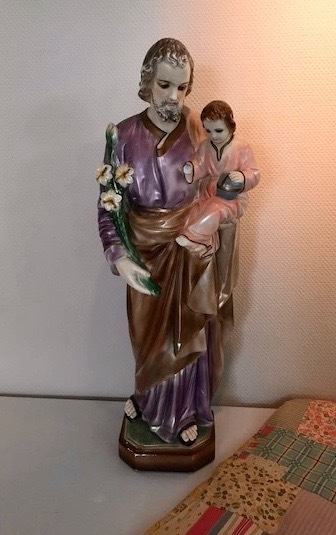 I keep the statue of St. Joseph that began as a Piecework prop in the space where I work at home, and I usually bring him with me when I work elsewhere, if I can. He is with me this week as I begin my residency at the Beaverbrook Art Gallery, a reminder of my ancestors and their manual labour. I contemplate the connection between their work and mine. I think about how they performed labour with their bodies, and I think about how artists, too —particularly performing artists like myself— work with their bodies. How is the physical labour associated with my work different from and similar to that of my grandmothers’ and grandfathers’ work? Why is physical labour usually described as “unskilled”? Can work performed by the body be creative? How do different bodies do different work? What is the role of the body in the life of the mind? These questions are a starting point for my work this week, as I begin to approach RITES, a series of performances and interventions that I will be creating in the Beaverbrook Art Gallery, both independently and in collaboration with visitors. RITES will pose questions about how we create and look at art, particularly in the museum setting. While some RITES will respond to works within the Gallery’s collection, others will explore those silent and invisible aspects of the museum that nonetheless define the visitor experience: What is omitted, not shown, or hidden from view? What does it mean to be a “visitor”? What are the rules, spoke or unspoken, of the visit? Do the artworks speak? Who can hear them? Who can talk back? I will post more thoughts here as the week progresses. I look forward to sharing the experience with you.